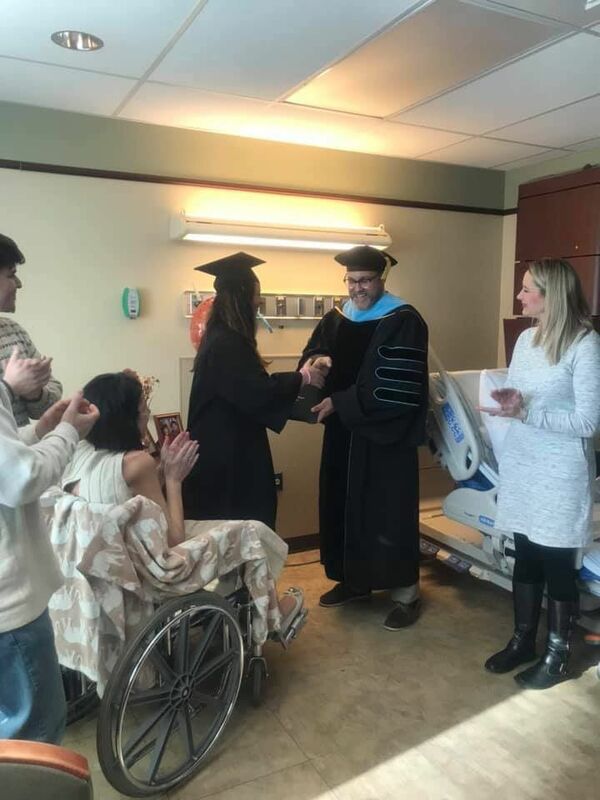 Abby Bodsford poses with her father, brother and mother after she was awarded her high school diploma during a special ceremony inside her mom's hospital room. Abby Bodsford is awarded her high school diploma during a special ceremony inside her mom's hospital room. Abby Bodsford holds the hand of her mother, Stephanie, after Abby was awarded her high school diploma during a special ceremony inside her mom's hospital room. For one day, Stephanie Bodsford’s hospital room was transformed. A “Congrats Grad” balloon floated in the air and a Class of 2019 banner hung on the window. The medical devices helping keep her alive remained, but there was something that a family aching from a surprise cancer diagnosis in February hadn’t had much of since: joy. It was in Stephanie’s smile, a “larger than life” grin that spread to her family, friends and members of the Powhatan High School staff gathered inside of room 289 at Johnston-Willis Hospital room last Wednesday. Still, the significance of the day was not lost on those present. Instead she opted to live her final few days to the fullest, surrounded by her husband of 21 years and their two children. Stephanie had seen her son graduate high school, an occasion she captured with a multitude of photos with friends and family after the Saturday ceremony in June 2017. Now it was her daughter's turn. Stephanie was supposed to be there. The family had scheduled doctor's appointments well into the spring. Her health deteriorated quickly, though, with the failure of her kidneys, leading the Powhatan High School staff to ask if it could make special commencement accommodations. Abby Bodsford was supposed to graduate on June 8 alongside roughly 350 other seniors at the high school. Instead she walked by herself - but she was far from alone. During a ceremony last Wednesday afternoon inside the Chesterfield hospital, Abby became the first member of the Powhatan High School Class of 2019. Her mom - sporting a smile and a new haircut for the occasion - was there holding her hand. Abby wore a cap and gown and received a diploma signed by a School Board member and Superintendent Eric Jones. Principal Mike Massa presided over the brief ceremony, changing the text of the charge to graduates he normally gives into the future tense, because Abby still has work left to do. Massa gave the senior, a cheerleader, her diploma after school counselor Sarah Baltimore handed it to him, the way a “normal” graduation would happen. The moment came with applause from her brother, father and mother, beaming from her wheelchair. They celebrated with cupcakes and flowers, hugs and stories, and the melodies of her older brother’s music fraternity. The Shenandoah University vocalists traveled from Winchester to serenade Stephanie with the sound of “Oh Shenandoah” and “A Brother at the Door,” among others. The music, like most things that day, brought out the smile she was known for. Within a day she was gone. Stephanie Marie "Wah-Wah-Tassee" Custalow Bodsford died at 10:22 a.m. last Thursday. She was 47. Stephanie helped build a small car restoration company - Amazing Finish of Virginia - with her husband, who she met when she was the assistant general manager of a car rental company. "Technically she was my boss and she liked to say that hasn't changed," Patrick said. "In reality I guess that's true." She got sick a few weeks before Christmas and Patrick took her to the hospital in early February thinking she had pneumonia. An esophageal cancer diagnosis came back instead. The cancer killed 15,850 people last year, according to the National Cancer Institute. Only one in five people diagnosed with it survive for five years. Abby's tried not to think about the things - big and small - her mother will miss: marriage, her children, her senior prom on April 13. Stephanie won’t be there to see Abby in her periwinkle dress - the color of the esophageal cancer awareness ribbon - one she chose when she thought her mom had as long as five years to live. “In my head I was thinking ‘five years, that’s plenty of time for a miracle,’" she said. "When I was told a week .... it made me realize that I’m going to lose my mom at 18 years old." Abby is now set on continuing her mom's legacy - one of always putting others first and bringing joy into their lives. She still has classes to finish - English 12, algebra II and government aren’t going anywhere - but for all intents and purposes, Abby is a high school graduate. She plans to enroll at John Tyler Community College and transfer to Old Dominion University to study oncology, which deals with the prevention, diagnosis and treatment of cancer. She hopes to one day become a nurse, caring for cancer patients the way her mother was treated. Abby told her mom of the plan before she died. The news was met with a smile, Abby said.